The most esthetic one, with the sharp Henmilite crystal standing up in one small pocket created on the mamiliary Calcite. 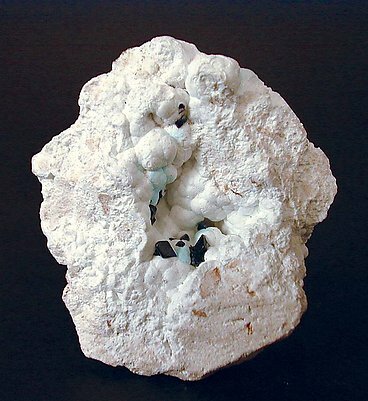 Nice specimen from the type locality of this rare calcium copper borate. 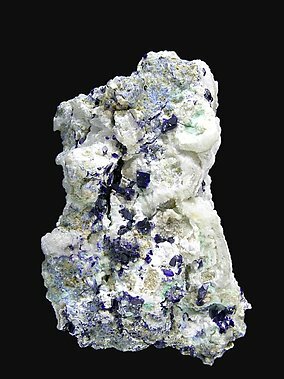 Henmilite shows well defined faces and edges with a deep blue color that contrasts with the white Calcite matrix. Actually the access to the Fuka mine is strictly prohibited and controlled. The specimen is accompanied by the label from the collection of the first specimen’s discoverer, with the handwritten notation of the date on which this specimen was extracted (February 2004). We will send the label to the buyer with this fine Henmilite.